Seasonal cycles and expansive clay soils are to blame for Texas’ foundation problems. When shopping for a home, most buyers have a list of criteria they’re looking for: a new kitchen, a nice yard, and the appropriate number of bedrooms, for example. But too often, homebuyers forget to look at one of the most important parts of a home: its foundation. 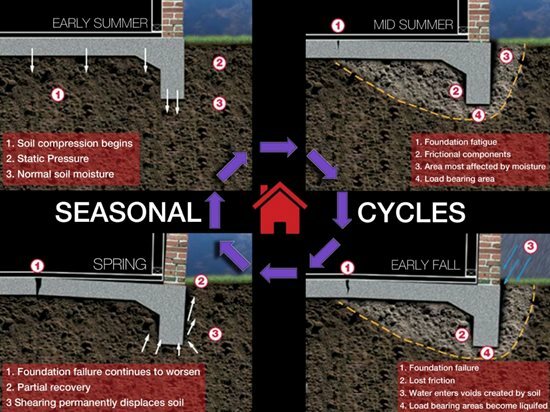 Thanks to unique soil structure and seasonal cycles, homes in Texas are particularly susceptible to foundation issues. To understand the problem, we interviewed foundation expert Steve Gregory, the owner and founder of Ram Jack, a foundation repair company based in Texas and Oklahoma. Steve has spent more than 30 years as an expert in foundation repair and invented new innovative foundation support systems. 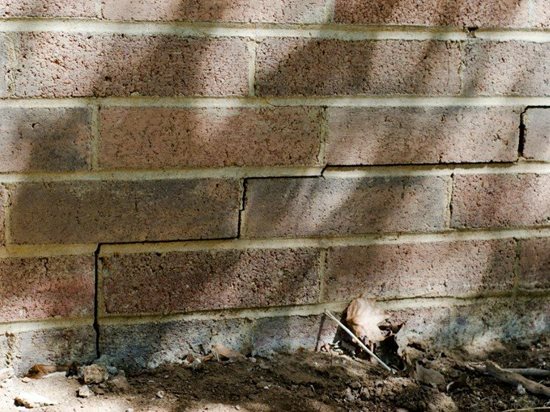 Cracks in exterior brickwork can be a sign of a failing foundation. Why does Texas have foundation issues, and how do they compare to other areas of the country? Texas’s most prominent difference from the rest of the country is its combination of variable seasonal cycles and expansive clay soils—in other words, soil that is prone to large volume changes. Some other areas of the country have similarly expansive soil, but they don’t generally experience the wide range of seasonal fluctuation that Texas does. In the Lone Star State, it’s not unusual to have a very cold winter followed by a hot and dry summer, and then the next summer could be cool and wet. This kind of fluctuation in the soil’s moisture content causes it to expand and contract greatly. This constant heaving and shrinking can break the foundation of a home, much like a piece of wire that’s been bent to many times. Texas is also unique in the fact that engineers have developed special foundations, including post-tensioned, to combat these problems. Jammed doors and windows. I recommend testing windows and doors throughout the house to make sure they open and close smoothly. Large openings such as these are usually the first points of pressure with a moving foundation. If doors and windows are sticking or showing gaps, it could signify a problem. Sloping floors. When a foundation shifts, floor sloping can occur near the point of the foundation failure. You may want to bring a pocket level to check the floors when viewing potential homes, or download a handy level app on your smartphone. Nail heads protruding from the walls. As the foundation of a home settles, the framing will begin to distort, as this happens strain is placed on the interior finish and can work the nail heads out of the sheetrock. Separation around garage door, windows, and/or walls. Often as a foundation settles, it will also rotate outward or longitudinally. This is evident at the corners and along weak points in the structure such as windows and doors. Drainage. Look for areas where water can pond against the homes footing. Plumbing leaks. Make sure the home is checked for plumbing leaks. Are there any types of homes that are more susceptible to foundation problems?There are an infinite number of variables that can lead to foundation failure. Typically any home built on uncompacted fill soil will be more susceptible to foundation settlement and failure, this includes both raised (pier and beam) and slab homes. This is because the home is relying on soils that exist within the zone of influence, the soil which will fluctuate due to seasonal cycles. Less susceptible would be structures with deep foundations extending beyond the zone of influence, often basement homes will achieve these depths but could still be at risk for other factors, including weak bearing soils. Also, a brand new home is just as likely to move as a 100-year-old one. From personal experience, new homes can suffer some of the worst damage, and it certainly can be devastating to the homebuyer. If a potential homebuyer suspects that a house does have foundation problems, what should they do?If you suspect that a home has foundation problems, the best thing to do is get a foundation repair company out to the house to inspect it further and provide a repair quote. Most companies will do this for free and they would be able to provide you with a much better understanding of the seriousness of the problem and what it will cost to repair. You may even consider doing this before placing an official offer, though you would need the homeowners’ permission to do so. The cost of foundation repair varies significantly due to the vast array of variables involved-it could range anywhere from $1,800 to $30,000. Figuring out early on how much a home’s foundation problems will end up costing could play a large role in determining whether or not a home is right for you. What about a home that’s had foundation issues in the past?Keep in mind that if you find a house that has had foundation repairs or piers put in, that doesn’t mean it’s a bad house. In fact, it could make it better. Most foundation companies warranty their work for the lifetime of the home, and the warranty is transferable to each owner. However, this is a common trap that home owners run into. Not only should you closely scrutinize the warranty and what it covers, you should also remember that a warranty is only as good as the company behind it. Look for longevity. Many companies will simply go out of business to avoid the backlog of warranty work and open under a new name. Ask if a company has insurance such as a “warranty trust” that protects you if in the future they are not around. After purchasing a home are there any steps a new homeowner should take to prevent future foundation issues?The best thing a homeowner can do to try and mitigate any future settlement is to manage drainage and vegetation. Tree and large shrubbery can be very detrimental to a foundation by causing dry pockets and differential settlement, keep them out away from the house. Guttering is also very important to keep the roof runoff from gathering around the foundation, be sure gutters are installed, clean, and the downspouts lead far away from the house.